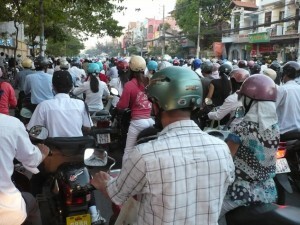 Having past my 50th year I felt compelled to follow my dream of Moving to Ho Chi Minh City and living in Vietnam. I was so sick of driving up and down the freeway every day and although I had a great job with a great company, I was very aware that the clock was ticking and my time seemed more valuable than ever before. 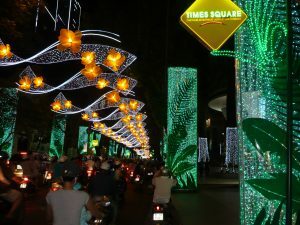 Through previous business trips I had met some Expats and I broached the subject of me moving to Ho Chi Minh City and over many beers they were able to give me some good advice on the basics of what I was going to get myself into. It was February 2010 and apart from being away from my now independent children, who I would miss very much, I had little reason not to take this opportunity to test my personal limits. I was now ready for an adventure in a country that was so vastly different to my home city of Perth Australia. 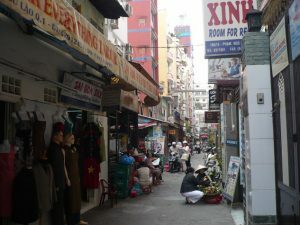 I had made many trips to Vietnam since my first holiday in 2006. A few were business trips but mainly adventures where I would just book a flight to Ho Chi Minh City and spend a few weeks exploring the country on a hired motorbike, enjoying the food and culture and taking photos. I loved it, and when my holiday was over and I returned to Perth I would plan my next escape. Through previous business trips I had met some Expats and I broached the subject of me moving to Ho Chi Minh City and over many beers they were able to give me some good advise on the basics of what I was going to get myself into. 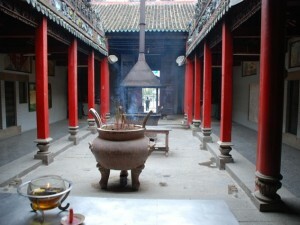 I had considered myself to be a reasonably competent world traveller with my experience of a working holiday in UK and riding a bicycle from London to Athens way back in my early 20’s and my more recently, work related trips to Malaysia, Vietnam, China and India but I found it very helpful to listen to these people who had lived in Vietnam for years. The big day had come and I finally walked out of the arrivals area of Ho Chi Minh City’s “Tan Son Nhat” airport into the hot humid air of Vietnam’s biggest metropolis. There are always thousands of people gathered at the airport and it is noisy with chatter and the honking of car horns. Taxis zoom in and double park. The pace at the airport is frenzied and it felt good to secure a Mai Linh taxi and enjoy the air-conditioned ride into District 1, the heart of Ho Chi Minh City. I had a room booked at the Ho Sen Hotel in Thi Sach St. and planned to stay for about 2 weeks until I found something a little more permanent. I had stayed at the Ho Sen Hotel before and felt very comfortable. The rooms are very clean and even though they rate themselves as a 2 Star Hotel the service is more like 5 Star. 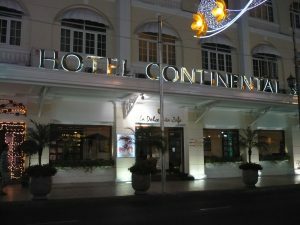 This Hotel is in the Dong Khoi area and right in amongst the big 5 Star Hotels such as The Sheraton, The Caravelle, The Majestic, The Palace, The Rex and The Continental and is also surrounded by some of Ho Chi Minh City’s finest restaurants. I found this area to be a good place to make the transition mentally from west to east as there are always tourists around and the Expat Bars are very welcoming. After 2 flights and an overnight stay in Kuala Lumpur it was a welcome relief to settle in to my Hotel room, have a shower and relax knowing that on Monday I didn’t have to drive down the freeway in peak hour to the office. I had now become the envy of my friends back in Perth or did they think I was out of my mind? It didn’t matter, this was the most exciting decision I had ever made and it bought back the thrill of absolute freedom that I had experienced during my cycling adventures in Europe a lifetime ago. I felt that the next chapter of my life was now beginning. I had made contact with a friend who was a member of the Vietnam Swans Football Club. This is an Australian Rules Football Club whose members are keen football players and also do a lot of Charity work in Vietnam. They love their game and are great ambassadors to Australia. Click here to see more about the Vietnam Swans. At the age of 53 I decided it was a good idea to join the Vietnam Swans FC for the social aspect and go to training to keep up my fitness. It wasn’t long before they were one bloke short for the weekly scratch match and I was asked if I could fill in for a quarter. Long story short, I played three times in scratch matches, which was great fun but way too strenuous for an old bloke like me. I found a mini hotel in a lane off Pham Ngu Lao St, with a room on the second floor, it had a balcony overlooking the lane and it even had glimpses of the near by park. This suited me just fine. 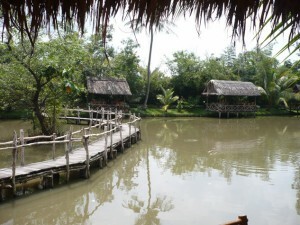 There are hundreds of these little places in the Pham Ngu Lao area for about US$400 a month including wifi. This place was perfect while I got to know the area and found out where to eat and how to get around. 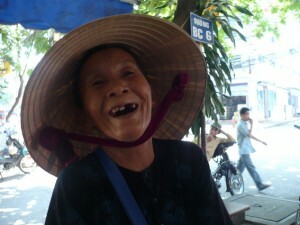 Vietnamese people are very family oriented and they will soon adopt you and treat you as family. It is acceptable for them to ask, “How old are you?”,“Are you married?”,“How many in your family?” The kind of questions that are possibly not asked in the West. Chi’s Café is further along the lane and a great little eatery with cheerful English speaking staff. Chi has run this Café for many years and it is recommended in The Lonely Planet’s guide to Vietnam. I became a regular lunch customer at Chi’s and always looked forward to good food and unique atmosphere. Chi also rents motorbikes and my choice was a Honda Wave 110. These bikes are a good size and have larger wheels than most scooters, which tends give you a better chance of staying upright should you hit a pothole. They are semi automatic so you need to change gears but they are a basic design and I never had a problem apart from punctured tyres. Chi rents these for Vnd100,000 per calender month. 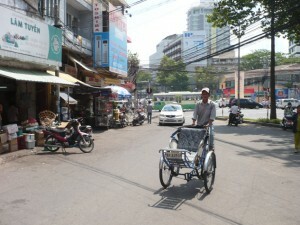 Once I had my motorbike there was no stopping me and getting around Ho Chi Minh City is easy if you know a couple of tricks. Firstly, Ho Chi Minh City is divided into 24 districts: 7 named urban districts, 7 numbered districts, and 5 outlying named suburban districts so if you have a rough idea of where each districts is in relation to each other it is just a matter of finding the main arterial road to that district. Secondly, every building in Vietnam has its street address written out front so as you travel along you will always know what district you are currently in. Once I figured this out I was able amaze my friends with my miraculous ability to negotiate the streets of one of the most densely populated cities on earth. Any doubts that I had about moving to Ho Chi Minh City were quickly dissolving as I made friends and became more confident motorcycling in heavy Vietnam traffic. 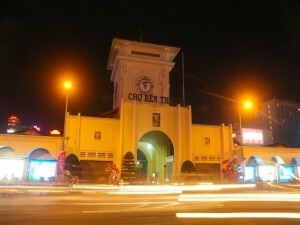 I had settled into my room in Pham Ngu Lao and was looking forward to the adventures that were to come in Vietnam.